Brown in color. After molting, new feathers may appear nearly black, fading to pale brown with age. Bases of feathers are white. Skin on head and neck often free of feathers has a bluish tinge. Intensity of this color varies according to season of year, changes in surroundings, and behavior of nearby birds. Is the second largest living bird in the world (next to the ostrich). 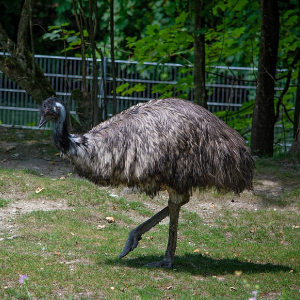 The emu is flightless with wings only 1/10th the length of its body.